It takes an actress of magnitude and majesty to tackle the role of “A” in Three Tall Women, Edward Albee’s devastating drama about aging. And that role has found its match in Glenda Jackson, the British actress who was born to play it. Jackson, celebrated star of stage and screen, has dazzled audiences for decades with classical roles ranging from Hedda Gabler to Mary, Queen of Scots. Still, it took her a twenty-three-year stint as a Member of Parliament (1992-2015) and her performance as King Lear at the Old Vic (2016) to prepare her for the challenges that Albee’s “A” presents. As “A”, a 92-year-old dying tyrant, Jackson rules the domain of her plush boudoir (elegantly designed by Miriam Buether), where this 100 minute heart-stopping, throat-choking drama takes place. 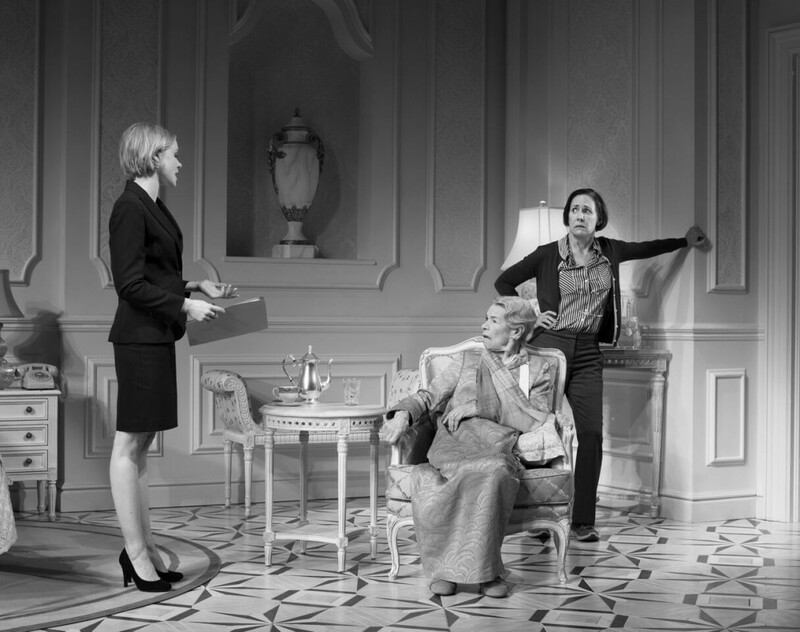 She’s waited upon by “B” (Laurie Metcalf), her much maligned caretaker in residence, and “C” (Alison Pill), an aide from her lawyer’s office, who’s there to help her sign her checks. But “A” is not “checking out” – far from it. “A” spends half the play raging against aging with a fury that matches Lear’s on his storm-tossed heath. Regaling her captive retinue with stories about her short, one-eyed husband and the thankless son who abandoned her, she’s as hilarious and harrowing as a vaudeville act on the decks of the Titanic. But never fear – this lady’s boat won’t sink, and she won’t go gentle into that night. Meanwhile, despite the fact that she’s miserable, miserly, misanthropic, vain, bigoted, anti-Semitic, and incontinent, she’s actually good, entertaining, charismatic company. Then, in sly, Beckettian fashion, Albee pulls the rug out from under us. “B” and “C” are suddenly transformed into younger versions of “A” (ages 52 and 26, respectively). Together they try to assemble the pieces of her life – that is, if memory serves, and memory is always a slippery slope in an Albee play. The shock that part two of Joe Mantello’s stunning production offers is yours to discover, and believe me, it’s the theatrical tour de force of the season. 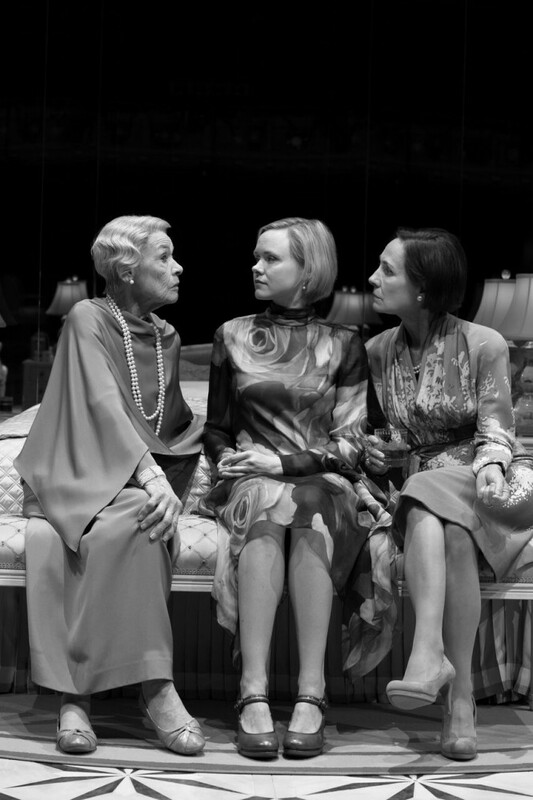 Dressed in Ann Roth’s stunning costumes, this trio of fine actresses offer seamlessly interwoven performances. In her violet gown and pearls, her hair coiffed into a steely silver helmet, Jackson towers over them like a rugged figure etched into Mount Rushmore. “I am here, and I deny you all!” she shouts defiantly. As her middle-aged version, Metcalf offers a salty, snarky “B,” giving as good as she gets. “You’re dying from the minute you’re born,” she retorts. As “C,” the 26-year old version of “A,” Pill offers a poignant mixture of youthful defiance and vulnerability. “I’ll never be like you – either of you!” she cries at one moment. Then at the next: “I haven’t had the happiest moments of my life, have I?” she entreats, seeking reassurances she’ll never get. No, Albee characters like “A” are “cruel only to be kind,” until the end. 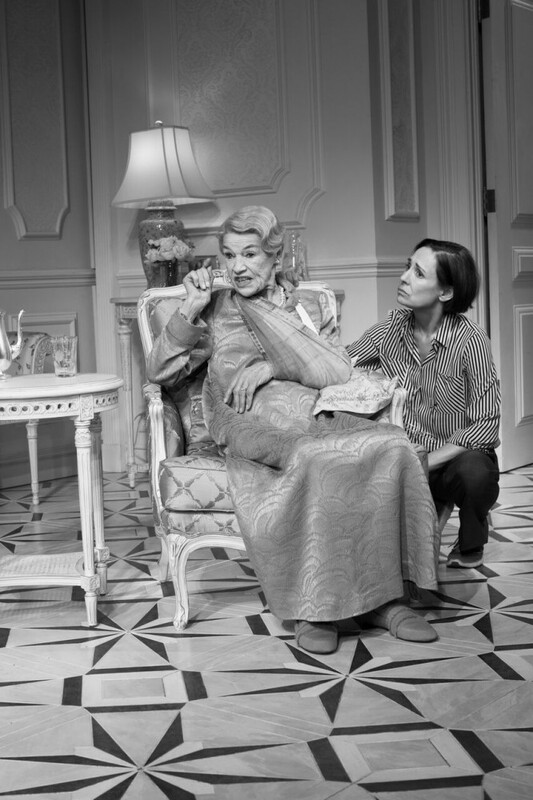 Albee died less than two years ago, but he haunts this production of Three Tall Women – in more ways than one, as you’ll discover. In interviews, he’s admitted that the play was inspired by his own adoptive mother, Frances Cotter Albee, an intimidating, unloving, domineering woman, as he described her. He wrote the play in 1991 following her death, and has publicly described the play as a kind of “exorcism” – of a force in his life that clearly caused him great pain. But, as in his other great plays about marriage and family (Who’s Afraid of Virginia Woolf, A Delicate Balance, The Goat), Albee had the genius of turning suffering into theatrical gold. The brilliance of his writing – its clarity, its economy, its precision, its penetration to the essence of human existence – has never shone brighter than in this unforgettable revival.